Why exactly is power-law distribution for asset returns inconsistent with EMH? It is trivial to write "standard" economic model where returns have fat tails, e.g. if we assume that stochastic process for dividends / firm profits has fat tails. That of course may not be very satisfactory explanation, but it still shows that EMH != normal distribution. 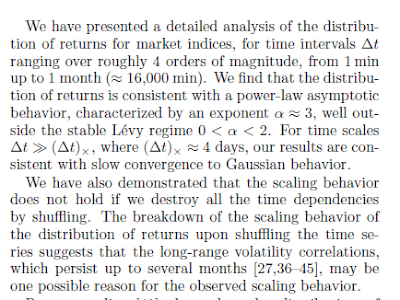 In fact, Fama wrote about non-gaussian returns back in 1960's (and Mandelbrot before him), so the idea is not exactly new. The work you describe here is certainly useful and interesting, but pure patterns in data (or "stylized facts", as economists would call them) by themselves are not enough - we need some theory to make sense of them, and it would be interesting to hear more about contributions from econophysics in that area. It's also worth pointing out that EMH, as I understand it, doesn't assume or dismiss that returns follow some specific distribution. Rather, EMH simply posits that prices reflect known information. For many years, analysts presumed that EMH implies a random distribution, but the empirical record says otherwise. But the random walk isn't a condition of EMH. Andrew Lo of MIT has discussed this point at length. The market may or may not be efficient, but it's not conditional on random price fluctuations. Separately, ivansmi makes a good point about models. You need a model to reject EMH. But that only brings you so far. Let's say we have a model of asset pricing that rejects EMH. Then the question is whether EMH or the model is wrong? That requires another model. In short, it's ultimately impossible to reject or accept EMH, unless of course you completely trust a given model. But that brings us back to square one. Welcome to economics. Considering the autocorrelation, from 10 minutes to 10 days, this can still be reflect efficient market pricing assuming prices reflect the probabalistic uncertainty as to the return persistence, even if it is known that there will be some form of persistence? You make a very good point, epistemologically, as regards the purpose of hypothesis testing. One can only seek to dismiss the null hypothesis, which of itself causally does not prove that alternative hypothesis is therefore true. And hence data does not prove that certain ideas must be true. It confirms, alternatively, that certain ideas are statistically unlikely to be the case. Perhaps that has been part of the problem - the statistically rejection of a null hypothesis in financial models has led to a belief that the alternative hypothesis must hold good? By using the title "The physics of Finance", the author intends nothing but fraud. There is nothing close to physics that authors or anybody else have derived from finance. Large number of data and modern computers make it very easy to observe data. 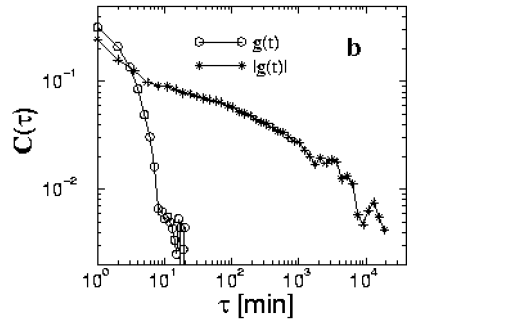 But to conclude anything in terms of physical law or Boltzman style observation has never been achieved. When the author using fat tail without even bother the mathematical equation (it has to be universally accepted), it deserves a big laugh. I think you are misreading the idea of using Physics. It is not we drive Physical laws from finance but rather apply known physical laws in finance, which is shown by distinguished mathematician like Mandelbrot. The physics of finance is one of the developing fields in research what is called 'econophysics'. There is now large literature on statistical mechanics of complex systems. Financial systems are not totally artificial as it is thought to be but manifest similarities. I understand your critique but calling it total fraud is little unfair and you need back up your argument with literature and evidence. I would first approach with a good faith to other people's work before accusing them with fraud. This sort of analysis is long overdue for the financial markets, for the markets in stocks and bonds, and for the instruments derived from those basic elements. The last twenty years or so have seen endless amounts of networked computing power applied to these markets. The tools of statistical physics, of dynamical systems theory, and of network theory, as well as those of mathematical ecology - all of which have emerged to deal with complex systems - are exactly the right ones to be used in these analyses. It's high time that the untested notions of economic theory, such as the efficient market hypothesis, be subjected to real scientific scrutiny. Those notions emerged in a data-poor past. To carry them forward blindly turns them into religious dogma. I'm frankly appalled at what passes, in much of economics and finance, for knowledge. It is nothing of the sort. Those who called themselves quants blindly implemented ideas, such as the Gaussian copula, that proved disastrous in the current computing environment. In particular, the assumption of uncorrelated assets was completely destructive of the marketplace. It shows an appalling lack of understanding about the reality of this environment. Time to get down to facts. Medical accountants:Health professionals can take the best tax solutions from professional medical accountants. It is not possible to manage big accounts without professional accountant. 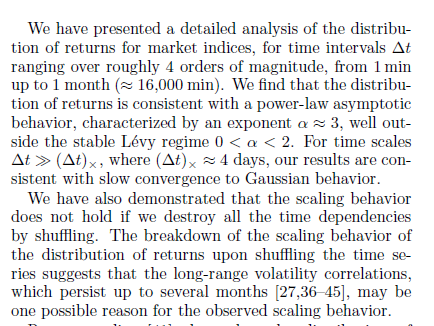 A particularly interesting paper is this one, again by the Boston group, quantifying several ways in which market volatility obeys several quantitative laws known from earthquake science, especially the Omori Law describing how the probability of aftershocks decays following a main earthquake. Well, truly said, finance sector can be seen by many aspects. Even it can be analyzed not only with physics but it can be analyzed through various other sectors. There are many probs beginning in this law.. So I think we should study first the previous law records. It has come to my attention that a solution to the puzzle of why large fluctuations in prices have an inverse power law distribution goes unanswered. This is an easy corollary to the principal result of my 1999 book, Axiomatic Theory of Economics, Theorem 12, the Law of Price Adjustment. My theory describes a single instant in time. Of course, instants have the habit of following one another, eventually forming something called history. So it is natural to inquire, not just what the price is at a given instant, but what the distribution of price changes is over history. This I did not do in 1999. Addressing this issue requires an additional axiom: the parameter called importance, μ, must have an exponential distribution, exp(-μ/θ)/θ. In point of fact, the only restriction that I placed on μ is that it be a positive real number. 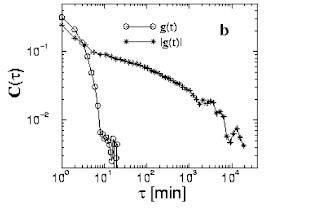 But negative monotonic distributions with this support and moments of all orders are not that numerous. Why not the exponential? The fact that an exponential distribution of μ implies an inverse power law distribution of price fluctuations is motivation enough for most economists to accept this new axiom, and my other results require only that the distribution of μ be negative monotonic on [0,∞). This is very important part to be served in the market to gain the law of finance in the market for the good one trend. The NSE BSE Tips have been proved to be very much helpful in gathering the personal finance. Here your post about Power laws in finance is very helpful for me. I have never read this type of informative article before.Hope you will update us form all relevant information in future. That is a really best think i am totally agree on that. best article around and great concept thank you for your best words and encouragement http://www.coolukpayday.co.uk/today. Basics of finance can be easily understood through this outstanding article for beginners, who have not much knowledge of finance.Thanks for this sharing. I am glad to find your impressive way of writing the post.Thanks for sharing the post.i'm sharing your information to all friends. I read this article law rules and its great helped him in my MBA exam thanks for share it mba personal statement . Our finance personal statement have a real ability for writing unique content. I like how you think and the way you represent your views in this article. Epic Research fulfills your all trading requirement and support you to make a big profit, traders can contact with our experts for free advice. Did you know that you can create short links with BCVC and get cash from every click on your short urls. Like the way you tied all the details, I agree with all the points mentioned here, really appreciate for this work. I looking for Free MCX Tips service. I See Your Blog Daily, Its Blog Is Very Usefull Blog & i like and love so much. You can see it ..
We provide a wide range of industry specific financial projections and forecasting model templates via our market place provided by freelancer financial modeling experts. Thank you for sharing this powerful article, your explanation is clear and very easy to understand. Please kindly visit our site to get more information about finance. Tax preparation is the information provided by a person or a company to a government body proclaiming all of their liabilities for taxation purposes. Accounting firms and CPAs are able to take on Tucson Tax Preparation Services preparation outsourcing to fulfill the substantial rush from customers at the time of the tax paying season. Binary options are a rather risky bet. More information on Indicators Discussion - METATRADER FORUM - Forex Lasers Forum on forexlasers.com. Nice post. it is very interesting and informative. Thank you for your sharing. I must say, as a lot as I enjoyed reading what you had to say, I couldnt help but lose interest after a while. Its as if you had a wonderful grasp on the subject matter, but you forgot to include your readers. Perhaps you should think about this from far more than one angle. Or maybe you shouldnt generalise so considerably. There are significant opportunities in Finance Functions within Police Forces to be transformed from a silo based culture that focuses largely on mega-convert.com activities to a process and metric based culture equally focusing on transactional processing, management information and strategic requirements. This transformation can deliver large cost savings, service improvement and better quality, faster processing. This is amazing article thanks for sharing. Great post you shared with lots of important points Thank you for sharing . Most successful businesses have created a business plan at some point, usually before their start-up. Why? A business plan is needed to address all of the central components to starting a business. It is essential to make sure that you, as a new entrepreneur have carefully thought through many if not all, of the important components of your business. Ideally, you need to do this BEFORE starting your business. What is a business plan? Business plans are generally prepared for two reasons: 1. To obtain financing for the business 2. To help determine if essential components of starting a experienced have been considered. Often times with new entrepreneur's (and sometimes even with the more experienced!) they overlook certain aspects of starting a business. So the business plan helps to ensure that most, if not all reasonable questions have been answered and strategies thought about. Although business plans are often considered optional - they serve a vital importance to entrepreneurs. it's a redesign or some design of a new website, the journey from "I want a website" to "I own a website that suits my demands" can appear difficult. Yet, by claiming the right questions at the right time, it is likely to get there without a loop. As a Web Designing Company Delhi, this is a very important matter. Best Home Packers and Movers we provide outstanding Relocation and shifting services in Delhi Packers and Movers Ravet While transportation everyone usually faces a lot of issues. But when you hire Packers and Movers in Pune, we assure you to take care of your goods without any issue. Our specialization includes office relocation, house shifting, car transport, office shifting, and many more.